Two of the best comedies of the last decade are Shaun of the Dead and Hot Fuzz. Both are excellent send ups as well as excellent examples of their respective genres. 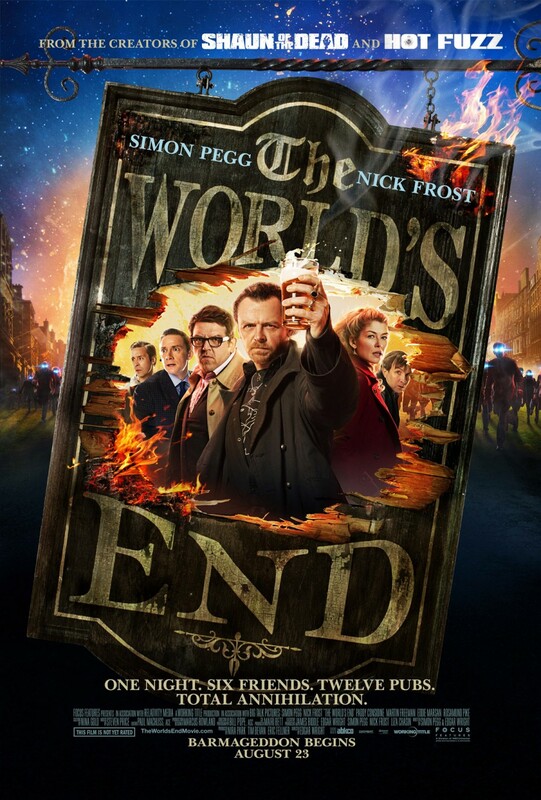 The third in this cycle of films directed by Edgar Wright and starring Simon Pegg and Nick Frost may lack the obvious genre ties of its predecessors, but The World’s End may be the best and most ambitious of the three. The World’s End is more specific, being a take on Invasion of the Body Snatchers rather than entire genres of film, but in addition to being a comic version of that, it is also steeped in Arthurian symbolism and an incredible depiction of addiction. The World’s End tells the story of Gary King, a man desperate to recapture the glory of his youth so he gathers his high school friends together to try to complete a pub crawl of their home town, which they had failed years before. Despite their very good reasons for not wanting to go with him, all four end up in Newton Haven with Gary once more. Initially their problems are with the obsessed Gary; soon they realize that there is something more sinister going on in town. Wright deftly juggles numerous concepts and plot threads, giving us a layered movie that delights on several levels. What stands out most is its take on the Arthurian Cycle, with each of the protagonists serving a medieval role. Those roles are spelled out in their surnames: King, Prince, Knightly, Page and Chamberlain. Gary King is the leader, Andy Knightley is loyal retainer, Chamberlain keeps them on track, etc. The quickly told story of their first attempt at the golden mile is echoed and expanded on their second attempt. The cycle repeats, only this time they finish. While the movie is immensely funny, what puts it over the top is how it affects real emotion. The characters feel like real people with real problems. I would have loved this movie without its big twist, that the entire town has been replaced by aliens who are essentially colonizing the Earth, and it had just been five friends hashing out a couple of decades of problems. As with all of these movies, the central relationship is between Pegg’s and Frost’s characters. Frost’s Andy is a guy who has done everything right, and still his life is falling apart on him. He is struggling to move forward. Pegg’s Gary has screwed everything up and is desperate for his young glory. To, the golden mile represents the lost promise of his youth. That was supposed to be the prelude to his life, not its apex. For the lead in what is ostensibly a comedy, Gary King is a deeply sad character. It is actually a chilling look as the life of an addict. That the World’s End manages to include that, along with rousing action scenes and big sci-fi concepts and have every part reinforce the other parts instead of distract from them is what makes it a great movie. For example, in one of the big fight scenes, Gary, despite being the second most able fighter after Andy, spends the bulk of his time trying to keep from spilling is drink. There is chaos all around him, but he cares more for alcohol than anything else going. It results in some very fun physical comedy, but also in a sadly funny character moment for him. The action serves to reinforce the character moments. The World’s End is a great film, as are Shaun of the Dead and Hot Fuzz. My opinion as to which of the three is the most entertaining may be fickle, but I tend to point to The World’s End most often. It has layers and depth that the other two movies can’t quite match.